Experienced athletes know: heart rate monitors work better with electrode gel ! This article cannot be sent per UPS/FedEx. The dispatch is only possible by freight carrier in combination with an order for a large piece of equipment. Coaches and athletes know: heart rate monitors work better with electrode gel/ultrasound gel. Get better and more reliable results for heart rate measurement with chest strap electrode gel! Body's own electric tensions are measured while measuring heart rate with a chest strap. This happens by means of small electrodes, which are integrated in the pulse monitor in the chest strap and are lying on the skin. It is necessary to keep the skin wet to get optimal measuring results. The Chest strap contact gel 250ml guarantees that the skin has always the correct degree of humidity to get continuously precise data. 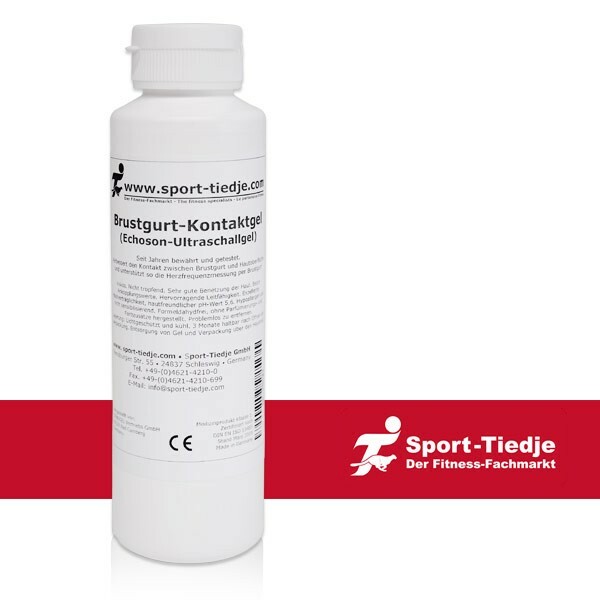 Without Chest strap contact gel 250ml, there are many difficulties which avoid reliable training data. If you exercise at low intensity, you probably do not sweat enough. It is just at the beginning of a workout that skin is too dry. The Chest strap contact gel 250ml provides from the beginning and for each training intensity an exact heart rate measurement. Switching from swimming to running or cycling can also distort measuring results, if no electrode gel/ultrasound gel is used. The special formula makes the thermo-stable Chest strap contact gel 250ml essential for a smooth and extremely reliable heart rate measurement !